Wing-half Dugnolle was born in Colonial India under the rule of the British Raj, in the ancient city of Peshawar, now part of Pakistan. On the family's return to England he settled in the Sussex area and started out in non-league football with Hove and then Southwick. In 1935 he was given the chance to make the grade when he was signed by Brighton and Hove Albion, for whom he played just seven times in a two-year stay. He then drifted back into non-league football and signed for the ambitious and then full-time professional Southern League side, Tunbridge Wells Rangers. It was from the Kent side that he was signed by Jack Tresadern in 1938 and it was a club Argyle had raided before – notably for Tommy Dougan under Robert Jack two years before. 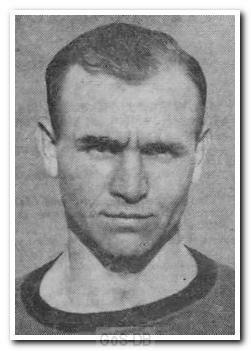 Dugnolle spent two seasons with Argyle, making just over a dozen appearances before his career was interrupted by the Second World War. On cessation of hostilities, he returned to Home Park, making a further six appearances in the 1945-46 season before returning to Sussex for a second spell with Brighton and Hove Albion. Between 1946 and 1947 he added a further 56 League appearances before moving out of the professional game and winding down back in the non-leagues of Sussex with Horsham.